Home » an academic » Facts » Health » Human Body » Knowledge » Medicine » Science » Why Is It Important to Learn Your Blood Type Before Transfusion? 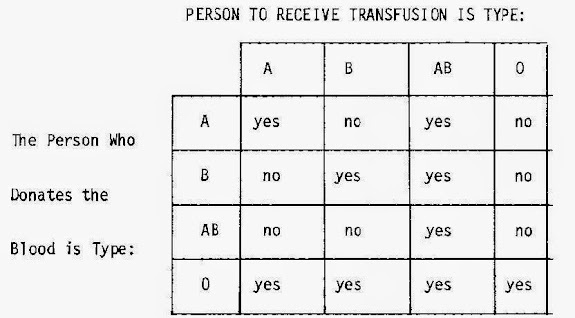 Why Is It Important to Learn Your Blood Type Before Transfusion? When your immune system detects antigens that aren't familiar, it triggers the release of antibodies that tag foreign invaders and mark them for termination! Now, there are two main types of antigens that form on your red blood cells. They’re called agglutinogens; they activate antibodies that smother invaders like a team of rugby players and cause coagulation in the blood. The two kinds of agglutinogens are wisely given the discernible names of A and B. So, your blood cells can have one kind of agglutinogen, or both, or you could have neither. If you have any of these antigens on your blood cells that mean that you don't have any antibody for it. If you did, those antibodies would attack your own cells. On the flip side, you do have antibodies that would attack the type of antigen that you don’t have. So, for example, if your red blood cells have A antigens on them, then your blood type A and your antibodies would attack type B. If you have B antigens on your blood cells, then you’re type B, and you have antibodies for type A. If you have BOTH, you’re type AB, and you don’t have antibodies for either. And some people have neither kind of antigen. Their genes actually code for an agglutinogen that just doesn't work, and they have the antibodies for both A and B. These guys are called type O. Now, just to keep things interesting, there’s another set of antigens on your blood cells that works in different ways from the agglutinogens. This is known as the Rhesus, or Rh System, and it’s actually a collection of 45 different antigens. But they're all produced as a single group. So you either have all of them, or you have none of them. If your red blood cells have the Rh antigens on them, we say you're Rh positive. If you don't, you're Rh negative. 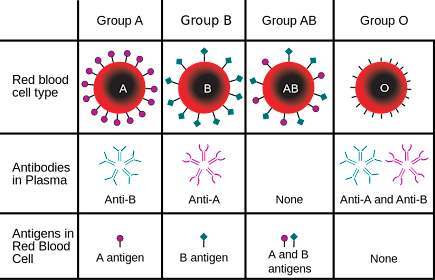 So this is how we end up with eight different blood types — A, B, AB, and O, each with a positive and negative type. Now when it comes to transfusing blood from one person to another, compatibility is kind of important to preventing a serious, possibly life-threatening, reaction. But finding the right match has less to do with what letter you have, than what letter you have the antibodies for which sounds confusing, but let us explain. So, type AB people don’t have antibodies for either A or B, so they can accept A, B, AB or O. But type O’s have both A & B antibodies, so they can only accept other O’s. As for the Rh antigens, people with positive blood types can accept either positive or negative blood. But negative-types are safest taking only negative blood. Because while they can tolerate positive blood—they can only do it once. After that, they’ll form antibodies against the Rh antigens that they received, which means they can never accept positive blood again. The human body is so weird! The universal blood donor has Type O negative. It is one of the most common that can give to almost anyone. However, there is a blood type which is known to be the most rarest. Do you know what blood type is it? You can check the spoiler below for the answer. It has 0.8 percent of the world's population. Blood Type AB-. Crislene loves Biology. Spending her time much on reading ebooks in different fields of science. Shares facts and trivia while on Facebook. Get connected and like her page on Facebook/Kwentologist. Thank you for reading Why Is It Important to Learn Your Blood Type Before Transfusion? posted on the website Kwentology if you want to redistribute this article please include the link as the source. Have some kuwento to share? Contact us!